People need to know about the differences in these birds, how to identify and distinguish among them, to know their behavior characteristics and the result of their behavior; all in an effort to cut down on the malicious, unnecessary attacks made by Grackles (pictured to the left) against house sparrows, tree sparrows and starlings. I hope to make you want to feed birds year round without attracting Grackles into your feeding area, knowing what they are capable of doing. When they do inevitably appear and reappear like a bad rash you can easily thwart their dirty business. 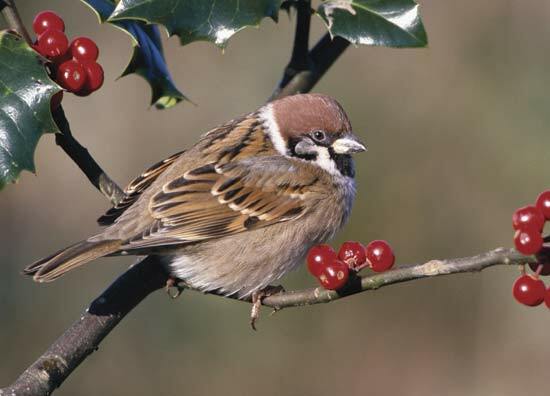 House Sparrows were brought here from England in 1850 as a solution to eliminating insect manifestation in crops. Since then they have become a fairly misunderstood species. I liken their unwarranted reputation for attacking crops, for menacing the native Tree Sparrows (pictured to the right) and making a mess on the ground, to the same belief that "Chariots of Fire" was an original masterpiece, instead of being a complete copy of "On Top Of Old Smoky"; their reputation just is not true at all. All House Sparrows and Tree Sparrows eat are some various things we put out including seed, sunflower seed, safflower seed, suet, millet and even cereal or crackers, and on their own their diet is said to be comprised eighty percent of insects. They do not have any interest in our garden so I don't see their threat to crops though I don't grow everything known to man. They aren't a nuisance toward native Tree Sparrows. I've never seen a fight between the two Sparrow species, ever. They don't seem to bicker much among themselves nor with any other bird species whatsoever. 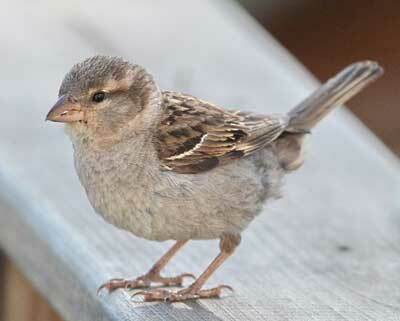 The House Sparrow is brown and grey appearing, with dark eyes and flat, little beaks. Males will have a dark colored bib. The Tree Sparrow has the same dark eyes and flat beak. The Tree Sparrow is slightly smaller, in a darker brown, with seemingly white stripes in the brown, on their chests and backs, (while House Sparrows do not have stripes) and the Tree Sparrow is most easily identifiable by its reddish brown mo hawk. It's very easy to group Starlings and Grackles into one species; crow. They aren't your father's conventional "Crows", though they are both from the Crow species. They look largely similar but couldn't behave any different. 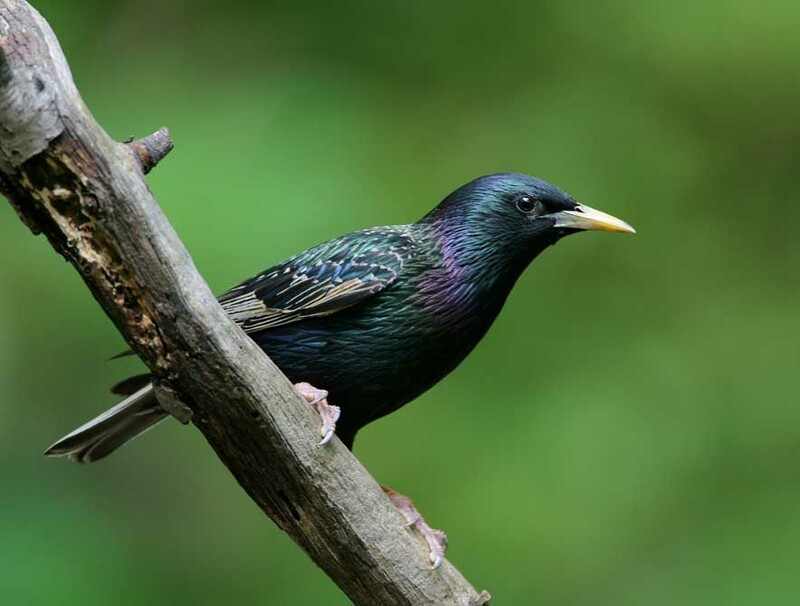 Starlings have yellow or light tan beaks and dark eyes with a crow-like appearance to their black feathered bodies. Conversely, Grackles, who we are attempting to isolate here, are very similar in appearance with all black feathers, but Grackles have gold or green looking eyes and black beaks. Grackles and Starlings will eat seed and are seen eating insects in the grass. That's where their behavior similarities seem to end. Grackles are the bird of prey of this group. Starlings are often their prey but Sparrows seem to garnish the most attention from Grackle attacks. Grackles are the most intelligent of this grouping but they are also the most menacing. Grackles will savagely attack and kill sparrows for territorial reasons as much as for food at the feeder. The manner in which they kill is upsetting and the feint of heart should skip the rest of this paragraph. Grackles will often injure a wing to incapacitate their prey. They they attack the head of their victim, maliciously pecking away until the head is gone or severed from the body. They bite off the tail feathers and the bottom of the abdomen connected to the feathers. They open up gaping holes in the abdomen. They don't kill adult Sparrows to eat them. They kill just to kill. They will eat eggs and they will go so far as to eat the babies of Sparrows. Eating for food is one thing, I can accept there is a natural order to things, but I can't idly sit by and watch this "thinning of the numbers" when it seems "the numbers" are already too thin. Simple seed and water will attract Grackles but, when alone, not as much. Foods that really seem to attract them include peanuts, corn and beef suet. (and subsequently any peanut butter concoctions intended to attract birds - they sure do - especially the kinds you don't want to attract) To keep a good mix of birds in your back yard and minimize attacks it is wise to only put out suet when you can be around to monitor and intercept any potential aggressive Grackle behavior. In your back yard consider this combination: common bird seed, sunflower seed, and or safflower seed and water are a good, safe mixture that will bring in the safely behaving birds, i.e. House and Tree Sparrows, Starlings, Robins, Finches, Cardinals, Blue Jays and so on. 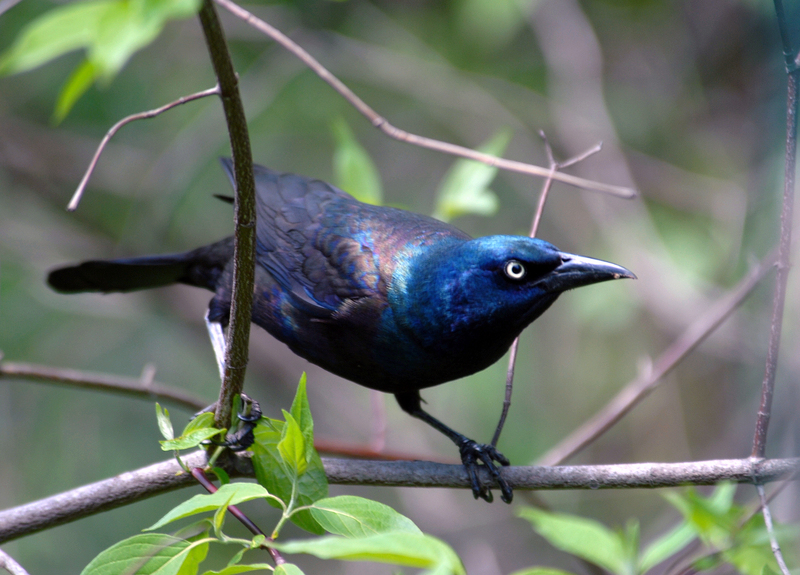 If you throw out corn or peanuts, or stock a suet feeder, you can expect Grackle invasion. Once you identify them you can start encouraging their departure simply by opening a window, or by going outside, clapping your hands if necessary and they will fly blocks away. They are smart. Around here they know they aren't welcome and they fly miles when they leave. I can see them. The rest of the birds know we aren't chasing them off and they just fly to trees and bushes in the immediate vicinity and go right back to business when I re-enter the house. It really is that simple. There really is nothing complex about keeping Grackles from invading and menacing your Sparrow Haven. Do Sparrows need our help? I would say yes. Consider it as part of the issue that is the manner in which our ecosystem is losing at an alarming rate. Think back to your childhood. Many reading this will remember a few events that don't seem to take place in our ecosystem the way they formerly had. Remember when birds would fly south for the winter when you were a kid? You would look up and see them over nearly every inch of sky - they would literally fill the sky and block out sun there were so many of them. Now it is never seen as such. "Cat 'O Nine Tails" were a commonly seen "nuisance" weed, especially near any source of water. Remember them? They looked like corn dogs on the end of a long wheat stem. You can find them occasionally, but not in abundance, and the "corn dog" part is very small now as opposed to hulking years ago. When it rains you would see thousands of earth worms out on the ground and the pavement near soil; not so much any more! So when you consider things are changing, numbers are dwindling, and we're all on this Earth together, doesn't it make sense to look out for our fellow inhabitants on this Earth? Human population is growing, but wildlife population is diminishing and it is really sad. It would be easy to make the case that for every sparrow needlessly slaughtered there are possibly 400 sparrows who will never live. Anyone can make a difference in helping them to not only thrive but return to the numbers they once were. Keeping Grackles from unnecessarily thinning the numbers would go a far way toward giving them a boost. They deserve it. They have feelings and personality, and when you are able to identify individual birds, get to intimately know one of them through rehabilitating one back to health, or just from simply noticing one that has an outstanding characteristic; (i.e. "that one has a single white tip to its middle tail feather") once you know one, once you realize each and every one of these quarter of a gram, miniscule sized, innocent beings possesses love, your life will never be the same. The first House Sparrow we rehabilitated we called "Feather" and she was a pitiful sight when we found her. She was so badly wounded she could not open her eyes for ten days, her head was made bald in the attack, of course perpetrated by Grackles. Her attack was much worse. It had left her with open sores as well as baldness. We had to treat them with Peroxide and a lot of attention. We didn't believe she was going to make it. There we were, feeding her baby food and seed and she was depressed. Then we pulled out the water and at the first taste of water she showed all the signs that she had a lot of fight in her. She got so excited she jumped into the air, blind, and flew a few feet. She would step up like my Jenday Conure. We wanted to keep her in doors until her feathers on her head all grew back together but that was not happening fast enough. After 37 days we released Feather with a still bald head as she had been made bald in the attack and her attack was much worse. We noticed her weeks later with the feathers almost completely grown back in and just a little bald spot left. Here we have evidence of her return to us. She is alive and well. She is still fat! We provide plenty of means for her and her bird kind. It's a pleasure to do so. I can not tell you how elated I was to see her back. The other birds flew off, and there we were, yelling " 'Hi, Feather' " and this video was shot through the glass with the window shut. Now she doesn't fly away. She clearly talks back. She stays there, beneath a big, fat ol' squirrel, staying there TO SEE US and TO LET US KNOW SHE IS THERE. Our little parrot told us first, Margot, by making a sound over and over that sounded like "Feather. It was really neat to see her back. Plainly you can see she has feathers grown in her bald spot of all different color and her eyes are very unique in appearance because of the attack, they were left crooked. You can see that and you can tell she is doing good. This was about three months after we released her and we thought we saw her at times but this was just the greatest actually getting to capture her return. We have a House Sparrow who we saved from an attack living in my hot tub in the bathroom. She can't fly well yet, so we are rehabilitating back to health. Her wing was broke but we have her wing almost back to normal and she can almost fly now. We will gladly be releasing her when she can get height. We call her "Pondo". I know it is not advisable that you name a wild animal but we couldn't help it. She is the second House Sparrow we have had to rehabilitate. We tape her wing to her tail feathers and that has stabilized it enough she can fly straight into a window screen or a curtain for instance but she can't get height yet. It has taken a month to heal this much. She is days away, and when she can go we will release her, immediately. Our method works. Here is a video about how we treat the damaged wing. Here is Pondo's release. I embarrass myself with my "Special Pondo Sparrow" but that's what I liked to call her. And she was. She was special because she bucked all odds. All experts said to put that bird down. Yet, here you see she was returned to her element and her wing was broken to begin with. We taped it, and taped it and taped it. Yes, some of her feathers of her wing had to grown back somewhat before we could release her, which of course we would not do UNTIL she could fly. We were not going to give up. Persistence and the blessing of God gave this lucky girl a second chance at life. Save a Sparrow. Shew a Grackle. Here is video of a Red Finch we named Anthony who came to us in 2011 and again, he was attacked and his eyes were injured so he could not safely fly, we rehabbed him back to health. His injuries were eye related. We treated him several times daily and kept him in our bathroom for a couple weeks. This is his release after we again noticed his behavior becoming very objectionable toward human intervention; it is the tell-tale sign of it being time to go!